This Valentine's Day, I urge you to forgo the typical. Fine wine, fragrant roses, silky chocolates, intense passion? Snore. Boring! Where's your sense of adventure, people? Your fire, your moxie?! It's in the form of a recipe that is so wacky that it works, that's where. Hard Candy Cookies. Because I'm coming up short on ways to express that you need to try this recipe right now even though it doesn't have chocolate. I can't really explain how the idea first came to me, guys. But I had big dreams one particular day in the Piece of Cake kitchen. Dreams that involved producing a certain kind of cookie, something that would at once be buttery and crisp, but with teeny bits of chew tucked within. It could have been my ongoing mourning of Archway's Cherry Chip Nougat Cookies, which sadly no longer exist (holler if you hear me! ), but more likely it was just that sort of mad scientist feeling that tends to grab a baker every now and again. 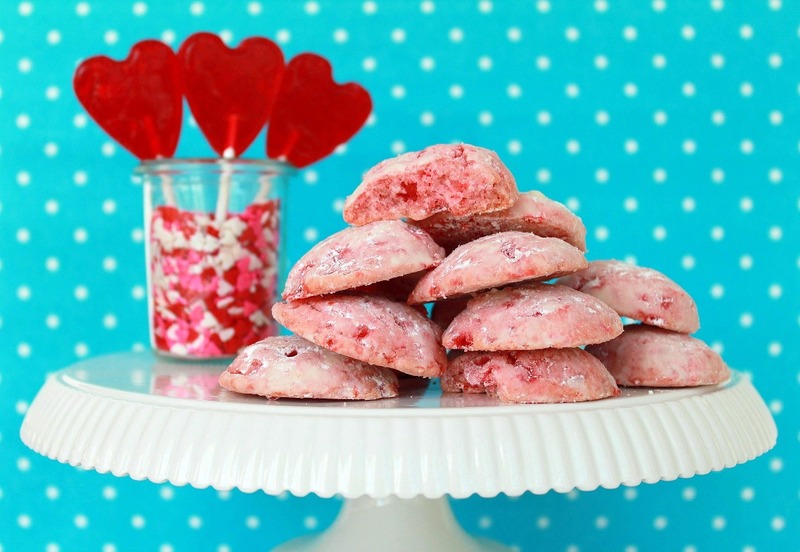 And so it came to be--bashed-up cherry hard candies mixed into a sort of shortbread cookie dough. I know, right?! What turned out to be really awesome about this recipe is the way all the elements played together in the oven. The cherry flavor of the candy really permeates the whole cookie without having to use any other flavorings (though you most certainly could bump up the cherry flavor a bit with an extract if you have one), and the candy bits just sort of melt into the cookie in places, while staying intact in others, which makes for the most phenomenal texture here. It's downright addictive, for real. When the cookie cools and the candy bits settle into their new forms, some parts end up chewy, while others pack a crunch. It's a sort of candylike cookie, and I just can't think of too many things more delightful that that. The cookies are topped off with a roll in some powdered sugar, which gives them an almost iced finish. Altogether it's like a Mexican Wedding Cookie-meets frosted sugar cookie-with a little howdoyado at the candy shop. I know, I'm flailing here. Just make these, and soon. You won't regret it. 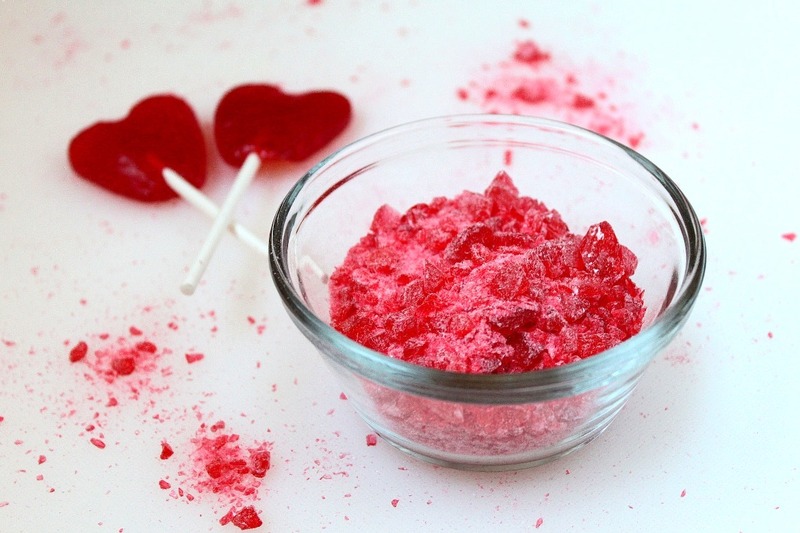 As you may have guessed, using cherry candies here is just a starting point. Lime, lemon, or a mixture of colored candies all sound delightful. Bump up the fruit flavor if you wish with a coordinating extract. Use just enough food coloring to color the dough slightly, but depending on the candies you use, extra color may not be necessary. In a medium bowl, whisk together the flour, salt and crushed candies. Set aside. In the bowl of an electric mixer fitted with the paddle attachment, beat together the butter and confectioners' sugar on medium speed until light and fluffy. Beat in the vanilla. Reduce the speed to low and stir in the flour mixture. Increase the speed to medium and mix until the dough comes together. If it still looks dry and crumbly, add a teaspoon or so of water and it should quickly come together. If you want to bump up the pink color of the cookies a bit, add a drop or two of food coloring. Line a baking sheet with parchment paper or a silicone baking mat (don't skip this lest you won't be able to get the cookies off the baking sheets because of the melted candy bits). Using a small ice cream scoop or two spoons, scoop out level tablespoons of the dough, then roll into balls and place them on the baking sheet. Chill the dough balls for 30 minutes in the refrigerator while you preheat the oven to 325 degrees. When the dough has chilled, bake until they're just beginning to turn golden around the edges, about 22-25 minutes. Let cool for a minute on the baking sheet before transferring to a wire rack to cool completely. To finish the cookies, place the remaining 1/3 cup confectioners' sugar in a medium bowl. Working a few cookies at a time, roll them in confectioners' sugar and then place them in a sieve. Shake the sieve over the bowl of confectioners' sugar to dust off any excess. Repeat until all the cookies are dusted with sugar. Store in an airtight container at room temperature for up to 5 days.